I want to talk about the “F” word. The one that makes many learning professionals cringe, the one that risks you or your ideas being taken seriously, the one that people want to say but imagine that by using it they will risk credibility and perhaps even look foolish. Yes, I’m talking about FUN. We all want to have fun…I’d venture to say we all want to have more fun than we’re having now. We dream of our work being more fun, of having fun on vacation, even just infusing a little fun into everyday tasks. It’s true that fun is subjective; what someone may consider a chore, others might get great joy from (for example, driving…I love it! other people, not so much…). Fun is also an attitude. You know that expression “you make your own fun”? Truer words never spoken. Everyone knows someone who’s a killjoy…as soon as he or she walks into a room, all the air is sucked out. We also all know someone who is like a ray of sunshine, who we love to be around because of the energy and attitude that the person infuses into even the most mundane tasks. I had a cousin who could make even standing in line at the bank fun. We gravitate towards those people because we want to have fun, be happy, and enjoy life. What bothers me most about the concept of fun is how it is handedly dismissed in many professional environments. For years, I couldn’t talk about games for learning to potential clients, or at least I didn’t call them games. Why? As soon as they heard the word “game,” they dismissed anything else I had to say. Most companies wanted “serious” training and the idea of learning through a game, or for learners to be having fun…*gasp*! Well it was just never going to fly, because learning was already devalued in most organizations as a cost center, and then start calling it FUN?? Anyone who wanted to be taken seriously was not going to start throwing around the F word. Within the last 9 months, I’ve seen a shift in the market. I get requests for proposals from companies who are specifically looking for learning games and health games. Many are still tentative, nervous; they’ve heard about badges, gamification and social apps but they aren’t sure what that means for their training initiatives or how game dynamics might improve learner motivation and engagement or patient adherence. Most organizations approach games very seriously, sometimes to the point of taking all the potential for fun right out of them. Fun can be serious and challenging and look an awful lot like work, just ask any athlete. The attitude, the expectation that even when we face our most difficult challenges and most serious subject matter, that human beings strive to be happier and have more fun…these ideas don’t have to be in conflict. Nathan Verrill recently gave the keynote at LEEF titled “Work is not the enemy of fun.” He talked about how immersive games can be designed to address even the most serious social and business issues while fostering opportunities for fun to get (and keep) people’s attention and increase their engagement in the hardest process. Jonathan Richman made one of the most resonating points about marketing in a presentation at ePatient Connections last fall: you aren’t just competing for attention with your competitors…you’re competing with LOLCats. These presentations reinforced my opinion that in a world where there are so many distractions, competing media streams, and ways that we can choose to entertain ourselves, our business goals, and for learning professionals, our learning goals, must be addressed with strategies that account for human motivational drivers and the environmental context that we’re operating in. My conclusion? Fun is the new strategic advantage. Organizations should be embracing fun. Organizations who close their eyes to this necessity will suffer for it because employees and even customers will seek out fun where it exists. You want to attract and retain the best talent? Create a workplace that they are happy to jump into every day. 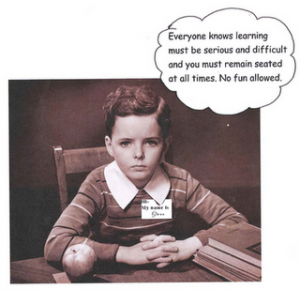 You want people to be engaged in learning activities? Design relevant training that people look forward to participating in. You want to attract and retain more customers? Create a company that’s a pleasure to do business with. You want to improve patient empowerment and adherence to help them have a healthier life? Create a tool that will motivate them to take care of their health. After all, who doesn’t want to have more fun?